Bring your beach chair and sandals and spend a week at the beach! Completely updated for a modern yet cottage feel, this cozy, air-conditioned end-unit studio is located just steps to Glendon Beach. It has high-speed wi-fi and a private enclosed patio where you can relax and enjoy refreshments. Sleeping accommodations include a comfortable queen bed and premium futon. The new mini-kitchen is fully equipped with refrigerator, gas cooktop, & microwave. Full bath has new vanity, bathtub with shower. Amenities include a nicely landscaped courtyard with gas grill and picnic tables. A beautiful swimming pool is private to our condominium community and out of sight from the public. The beach is just steps from your door. Restaurants and shopping nearby. Note: We are now required to collect State, Cape Cod and Town rental taxes totaling 12.45% for rentals from July 1, 2019 forward. If your booking is prior July 1, 2019, your quote will show a tax included. This will be manually adjusted for you so you don't have to pay it. Thank you for your patience. Janet loves the natural environment of this beautiful peninsula and has chosen to make it her home since 1984. She raised her family here and is a successful local Realtor. She enjoys adventure travel, hiking, kayaking, cycling and winter sports. She appreciates all Cape Cod has to offer and wants to share it with others by offering her home-away-from home beach condo with others. Janet chose to purchase this property first as an investment. It's close proximity to the beach and other area amenities, and it's charm made it the perfect choice. Periodically, she makes some improvements to update or enhance her guests' comfort. Starting with 2018 season, she has made major updates to the kitchen & bath, the A/C & heat system, slider, and furnishings with comfort and space-saving convenience in mind. After spending some time staying here, she realized what a gem it is. The unique 'beach culture' of this area was something she'd never experienced. Late at night, you can hear the sound of the ocean. You can take your coffee to the beach and watch the sunrise, or sunset at dusk. There is always someone willing to chat if that's what you like. And, you are not far away from the convenience of restaurants, shops and other natural attractions. toilet, combination tub/shower, Hair blow dryer provided. This Nantucket Sound beach is well under 200 steps from your front door. Verona gas cook top - 4 burners. New 2018. Space saving, new kitchen with refrigerator, microwave, gas cooktop, coffee maker (drip), and toaster. There is a new table and chair set (2017) inside the condo as well as an outside table with umbrella and chairs (seats 4) on the private patio. Samsung Smart TV. If you have accounts with Netflix, Amazon Prime and others, please remember to logout when you checkout. Or, you may bring your Internet TV Flash drive. The front yard has a gas grille and picnic table. Your patio is enclosed and private to you. Seating for 4 people. Large in-ground swimming pool private only to residents/tenants of this small condominium community. It is located in the back, away from public view. No smoking/no pets. Maximum Occupancy is 3 (including guests) Maximum ONE vehicle. There is no additional parking available. Great studio apartment ! Plenty of room for my husband and I.Very clean cute. Love the side patio nice patio table to sit at fenced-in and very private . Stopped at the pool for a quick swim nobody was there very clean .Walk to the beach small Beach but not too crowded. Stopped at the sailing cow Cafe for drinks and food. Very friendly people would definitely recommend going there. Can't wait to go back. Highly recommend this studio for a couples getaway. Thank you!!! Would love to have you back. Very nice week in Dennis. We where 3 adults and everything was perfect for us. The condo is very clean, both beds are comfortable and the new decoration makes the place very charming. We loved our stay and we will probably go back. Oh thank you! It means so much to know that guests are happy with my place. I appreciate the kind words. 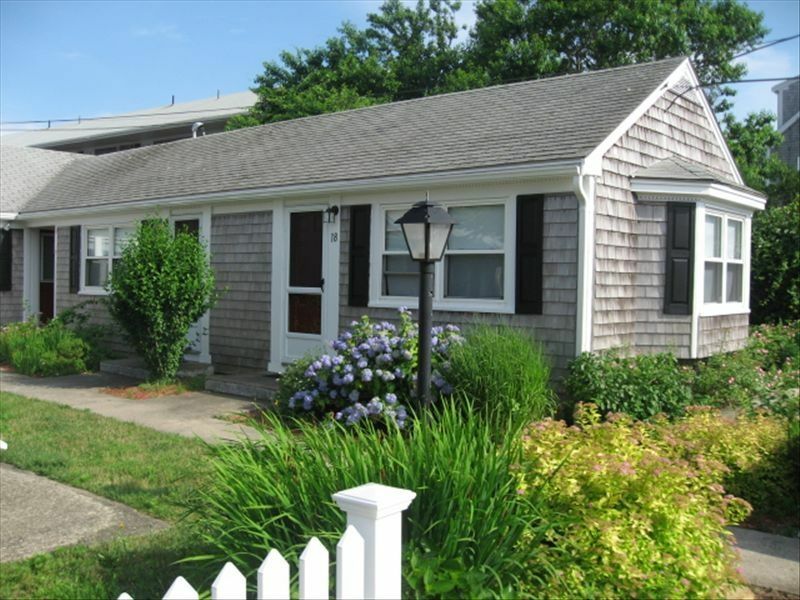 This condo was the perfect home base for a week at the Cape. The unit was sparkling clean and more spacious than we'd anticipated. Plenty of storage for clothing and toiletries, and the kitchen was stocked with pots etc. The walk to the beach on Glendon was just a couple minutes - it is a small but charming, family friendly beach. There was a lot of seaweed, so I opted to swim in the pool which was really clean and I had the place to myself. We enjoyed walking around the corner to the Sailing Cow for breakfast or lunch. Overall, Dennis Port served as a great Mid Cape location for day trips to wellfleet, Provincetown, etc. Janet was friendly and easy to communicate with prior to our trip, and we had no issues during our stay. Would definitely like to return! Thank you, thank you Brittany! You are certainly welcome back. Clean, and very close walking distance to the beach. Overall it was a cute little place. I would not recommend more than two people because it is very small if you need to use the futon sleeper, we had three of us and it was tight. The beach is right down the road and is also small so you need to get there early. The only negative was that we could not use the patio because the neighbors could look down on you. The neighbors house was above us on a hill, so not only did we not use the patio but we had to keep our curtains drawn all the time. Not able to open the sliding door curtain and having no patio made the space seem even smaller. I would suggest planting some tall shrubs along the back of the patio fence line to block the neighbors view of the patio and view inside of the cottage. Thank you for your feedback. I am sorry you were disappointed with the proximity of my condo to the neighboring property. There is a double driveway between our property and their house, which is much more separation than other properties in the area. No other renters have mentioned that it was a problem and have used the patio like an outside room. Anyway, I want to please all of my guests so will likely plant something or put a lattice top to the fence for more privacy next season. Also, I had been considering limiting the number of guests to 2 and probably will do so next year. Property was beautiful! Quiet, clean, beautiful pool. Very close to the beach which was great! However Glendon and Haigas beaches (which were the closest to property and free to enter) were small and tons of shells/rocks in the sand plus a lot of seaweed in the water. Had to walk through at least 10 feet of seaweed to get to clear ocean. Maybe it was a fluke, but I don't know for sure. Visited Mayflower beach which was absolutely beautiful, except it's a $25 dollar fee to get in. Janet the owner was very responsive to email and willing to help with whatever. With my husband and 5 year old, the cottage was just a bit small for me, but I knew it would be going into it. Great for one or two people though. The weather turned out to be beautiful and I relaxed so much! Hopefully my husband and I can book another stay this summer! Thank you!!! Would love to have you back. Right now the week beginning Aug 25th is open. After Labor Day the rates are less and the weather is awesome! Plus, we only have a 3-day minimum in non-summer months, so you can have a quick getaway. Check that out also. Things To Do in Dennis: Whether you're traveling solo or with your family, you'll find plenty of fun in Dennis year round. For culture buffs there's the Cape Cod Museum of Art with its art openings, Music & More Concerts and independent film series along with the world renowned Cape Cinema as well as several other fabulous art galleries and artisans along Route 6A. For the active visitor there's kayaking, canoeing and so much more. We have it all in Dennis. Enjoy! Cancellation Policy: If we are able to rebook your cancelled dates, you will receive a refund for each of those rebooked days. Otherwise, bookings are non-refundable. We suggest you investigate travel insurance options. Failure to remit 2nd payment due 60 days prior to arrival (if applicable) on time may result in cancellation of the reservation by the owner at the owner's discretion. State & Local Taxes: Any booking made on or after January 1, 2019 may be subject to a tax of 5.7% State Tax, a 2.75% County Tax and a 4% Local tax and that the tax rates may change before the rental period. This new law is for all Rentals starting on July 1, 2019. If you reservation falls before that date, we will adjust your payment accordingly.